Natural Dyes - Unalome Designs: It's you, by us. Achieving a gorgeous array of natural hues is truly a labor of love. It all starts in our garage turned dye lab, with three 100 quart stock pots, three propane burners, an old school clothes wringer, and the hard work of our dedicated team. Our self-taught clothing designer and color-chemist plays with thousands of combinations of ingredients, mordants, dye baths, over-dyes and various other ancient techniques which she stumbled upon through extensive research and home-grown experiments. She’ll develop a palette that is completely inspired by the available natural ingredients. She then heads to the drawing board to figure out how to reproduce the color-way on a larger production scale while guaranteeing that it will stand true to our values, the test of time, washing and exposure to light. In order to turn your bell-bottoms the fabulous color that you love so dearly; your garment ends up being immersed in a total of 5 different baths before a final strategic rinse and day long shaded hang-dry. Natural colors do not readily bind with your chosen fabric medium. Depending on the composition of the garment and whether it is composed of cellulose (hemp) or animal (silk) fibers, we must choose the perfect arrangement of ‘mordants’ to expose the fiber to; the dye-stuff then binds to the mordant, not to the fiber. Okay, still, why all the work? Not only do we use 100% organic dye ingredients which come (sustainably) straight from this beautiful planet, we reuse our color baths as many times as possible to assure minimal use of the most precious of resources (water). We have the utmost reverence for the environment and wish to help usher the movement away from fast, disposable fashion towards a new fashion paradigm; one of sustainable products which are homegrown and built to last. Why not use synthetic dyes? 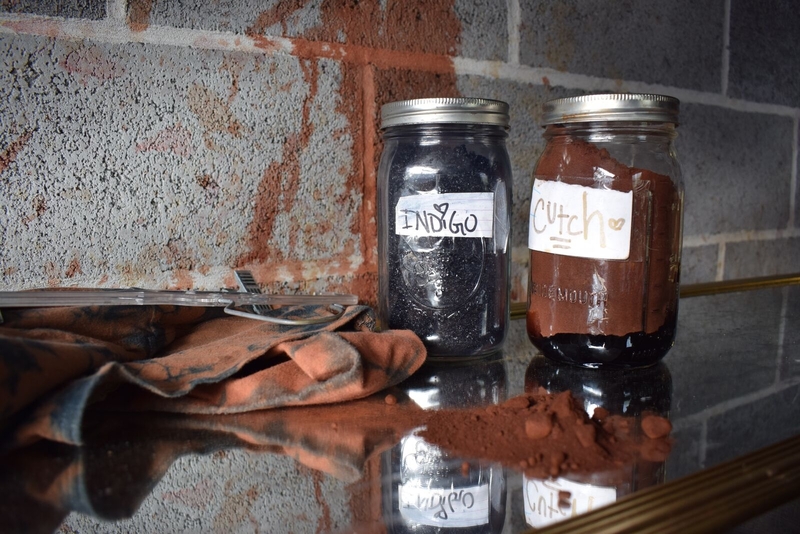 The transition from natural dyes to lab produced, chemical filled, synthetic dyes was spurred by the need to simplify and cheapen the manufacturing process. However, these easier to produce colors, have major consequences. The chemical waist from this process is dumped across the third world nations that are home to most major garment manufacturing, thus polluting most water in these areas.